Rick Santelli joined CNBC as on-air editor in June 1999, reporting live from the floor of the Chicago Mercantile Exchange. He is a regular contributor to CNBC's "Squawk on the Street" (M-F, 9AM-11AM ET). His focus is primarily on interest rates, foreign exchange, and the Federal Reserve. A veteran trader and financial executive, Mr. Santelli has provided live reports on the markets in print and on local and national radio and television. He joined CNBC from the Institutional Financial Futures and Options at Sanwa Futures, L.L.C. There, he was a vice president handling institutional trading and hedge accounts for a variety of futures related products. 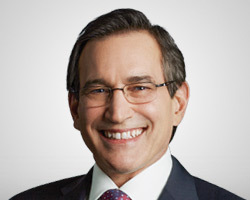 Prior to that, Mr. Santelli worked as vice president of Institutional Futures and Options at Rand Financial Services Inc., served as managing director at the Derivative Products Group of Geldermann Inc., and was vice president in charge of Interest Rate Futures and Options at the Chicago Board of Trade for Drexel, Burnham, Lambert. Santelli began his career in 1979 as a trader and order-filler at the Chicago Mercantile Exchange in a variety of markets, including gold, lumber, CDs, T-bills, foreign currencies and livestock.